WASHINGTON --- While our current combat fleet is composed of very capable vehicles, these vehicles have been in the inventory for decades and their ability to overmatch peer capabilities in close combat is starting to wane. As the Army prepares for future combat operations, it needs new platforms, with future growth margins, to maintain our ability to dominate the battlefield. This is a challenge for the Next Generation Combat Vehicle Cross-Functional Team, or NGCV CFT, to solve. The NGCV CFT was established as part of the Army's modernization strategy and is currently led by Brig. Gen. Ross Coffman. The team consists of hand-selected military and civilian personnel, who are charged with narrowing or closing Cross Domain Maneuver capability gaps. The team is well supported by Program Executive Office-Ground Combat Systems and Research, Development and Engineering Command leaders and representatives. The CFT serves as the primary Army integrator for Under Secretary of the Army/Vice Chief of Staff of the Army and Army Requirements Oversight Council decision for all supporting analysis, modeling, simulation and technical demonstrations. The NGCV CFT director, on behalf of the USA/VCSA, synchronizes the capability development process, and then rapidly transitions the requirement to a leader-approved capability into the Army Acquisition System. In future close combat formations, units equipped with NGCV must maneuver effectively in unrestricted, restricted, and dense urban terrain. 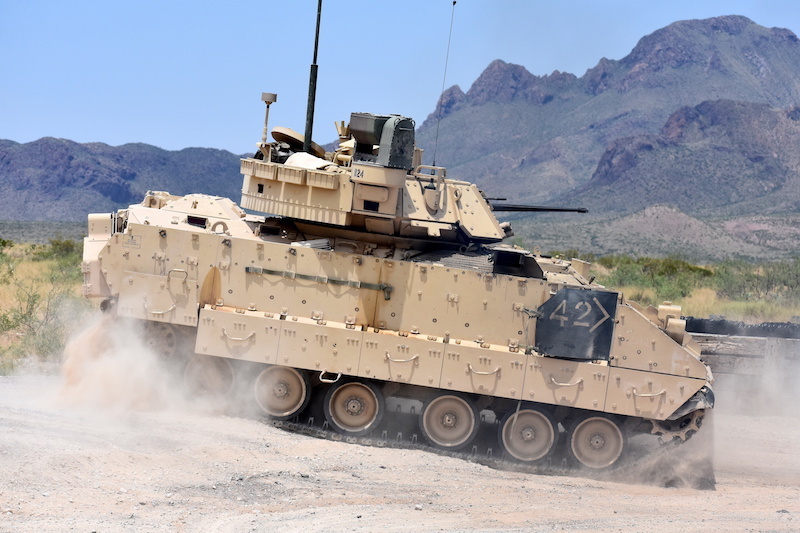 The NGCV-OMFV will be designed to maneuver Soldiers in the future operating environment to a position of advantage to engage in close combat and deliver decisive lethality during the execution of combined arms maneuver. -- Optionally manned. It must have the ability to conduct remotely controlled operations while the crew is off platform. -- Capacity. It should eventually operate with no more than two crewmen and possess sufficient volume under armor to carry at least six Soldiers. -- Transportability. Two OMFVs should be transportable by one C-17 and be ready for combat within 15 minutes. -- Dense urban terrain operations and mobility. Platforms should include the ability to super elevate weapons and simultaneously engage threats using main gun and an independent weapons system. -- Protection. It must possess requisite protection to survive on the contemporary and future battlefield. -- Growth. It will possess sufficient size, weight, architecture, power, and cooling for automotive and electrical purposes to meet all platform needs and allow for pre-planned product improvements. -- Lethality. It should apply immediate, precise and decisively lethal extended range medium caliber, directed energy, and missile fires in day/night all-weather conditions, while moving and/or stationary against moving and/or stationary targets. The platform should allow for mounted, dismount, and unmanned system target handover. -- Embedded Platform Training. It should have embedded training systems that have interoperability with the Synthetic Training Environment. -- Sustainability. Industry should demonstrate innovations that achieve breakthroughs in power generation and management to achieve increased operational range and fuel efficiency; increased silent watch, part and component reliability, and significantly reduced sustainment burden. "The future operational environment will be increasingly lethal, competitive, complex, and dynamic -- characterized by a high potential for instability and the increased likelihood of close combat in dense urban and congested terrain," Sponsler added. "Our potential adversaries have studied the American way of war and our preference for engaging at extended ranges with greater accuracy. Accordingly, they are developing, and will employ, close combat platforms and weapon systems capable of engaging U.S. formations at equal or greater ranges and with direct fire accuracy equal to our own, coupled with accurate and massive artillery and rocket firepower."